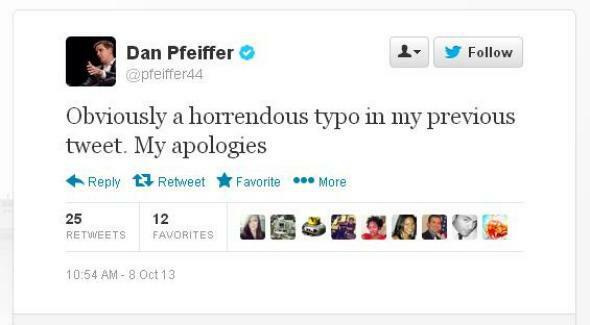 Dan Pfeiffer Twitter typo: White House account tweets racial slur. Should Autocorrect Save You From Using the N-Word? A bigger typo, Twitter has rarely seen. Dan Pfeiffer, deputy communications director for the White House, tweeted today that he was very pleased with an NBC News article that mentioned the role of cable and the Internet in political polarization. And then he tried to tweet that this was “a much bigger factor on the right” than on the left. One problem: The “b” key is right next to the “n” key. The slip-up prompted an immediate apology from Pfeiffer and an interesting suggestion from a Gawker commenter: Should autocorrect or spell-check programs flag offensive slurs along with typos, especially on a public platform like Twitter?